Air is loosely based on the adult visual novel of the same name but without the "adult". It explores the relationships and mysteries of several characters and their intertwined fate. Yukito Kunisaki is on a journey in search of the Winged Maiden who was bound to the sky centuries ago, after hearing an old childhood tale from his mother. As Yukito shows his puppet show to people in an attempt to make some money, he finds himself in a small town in which he did not expect to stay very long. However, when he meets an unusual girl named Misuzu, things take a drastic turn as he is invited to stay with her. By staying in the quaint town, Yukito soon becomes friends with the locals. As he gets to know them better, he learns of their problems and decides to help, putting his search for the Winged Maiden on hold. With his search on hold, and his growing attachment to Misuzu and the small town, will Yukito ever find the Winged Maiden, or is she closer than he thought? I started watching this anime without knowing that it was based on an adult visual novel. Thankfully the anime was rather "clean" and enjoyable to watch. Like any other dramatic romance anime, the story features a main guy character with a mysterious girl. Instantly, the feeling and the story portrayed in the anime reminded me of Clannad and Kanon, with that deep underlying connection between characters that is not prominently shown in the anime. You will come to realise that although all the characters seemed distant at first, they slowly revolve around the main character and in the end create a combined ending. Much like the emotions shown through Clannad and Kanon, the story features an emotional ending that will bring a tear to your eye. Much of the story I can relate to a typical visual novel game, and some dialogue and actions were quite textbook style. The art I would say had the unique Clannad and Kanon feel to it, with the characters' faces being roundish with large eyes. If you have watched those then you would know what I am talking about. Thankfully, the various backgrounds and sceneries throughout the anime was really well illustrated with some nice textures to them. The theme songs were what you would expect from a dramatic romantic anime; melancholy and slow-paced. It wasn't all too bad, but perhaps was not to my taste. I guess it did suit the anime's theme well in the end. Voice acting was somewhat decent, although, I do question some character's voices were either too emotionless or hyperactive. The whole story basically revolves around Yukito Kunisaki and his arrival at a small town in search of a Winged Maiden. He encounters a mysterious yet peppy girl named Misuzu which he accompanies around the place. The story focuses on the relationship that these two share and the external influences from other people. Most of the girls that Yukito encounters have individual problems and wishes that indirectly relate to the Winged Maiden. Thus, it is up to Yukito to solve these problems like any other typical main character of a visual novel. In the end, much of the anime is really similar to a textbook style visual novel. It was not too cliche or boring, but it did have some predictable moments. Perhaps Clannad and Kanon would offer more of an interesting story combined with more characters and emotional output than what Air has to offer. What kept the story moving along was the constant cliffhanger moments in some of the episodes. Air is definitely for those who like some drama, romance and a bit of fiction mixed in. 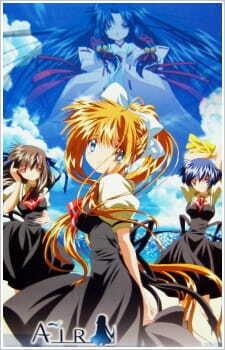 It was an interesting concept to make an anime really similar to a visual novel. Some bits were quite good, whereas others missed the point entirely. I would say that the backgrounds and sceneries were well illustrated. I didn't really mind the character art but it was not really to my taste. Theme songs were appropriate and voice acting was quite decent. Some characters were quite emotionless, other were hyperactive. The anime does little to explain even further of the Winged Maiden, and other characters had little development, so it was mostly guesswork or face-it-and-accept-it. I felt the emotions portrayed in the anime was not enough compared to Clannad and Kanon. Some bits were left unanswered and there was some holes in the story. It the end, perhaps it is best to start off with Air first before moving onto Clannad and Kanon. I was hoping for some strong character developments and relationships here, but it was all pretty weak.